Have you ever seen a friend or relative’s home theatre installation set up, complete with a projector, surround sound system, and reclining chairs and thought, if only? Imagine those lazy nights switching on Netflix or a movie at home, but instead of a TV or laptop, you could have a movie quality experience every time, on demand, in the convenience of your spare room. These days it doesn‘t need to be a dream. Home theatre setups have never been more affordable and accessible, and with the help of an expert installer, you could live the home cinema dream before you know it. Bluestar Communications is a local, family-run Canberra business with over 27 years of experience in the audio-visual technology sector. We have spent years honing our installation technique, to arrive at each job with the know-how and professional customer service you deserve for your home media solutions. 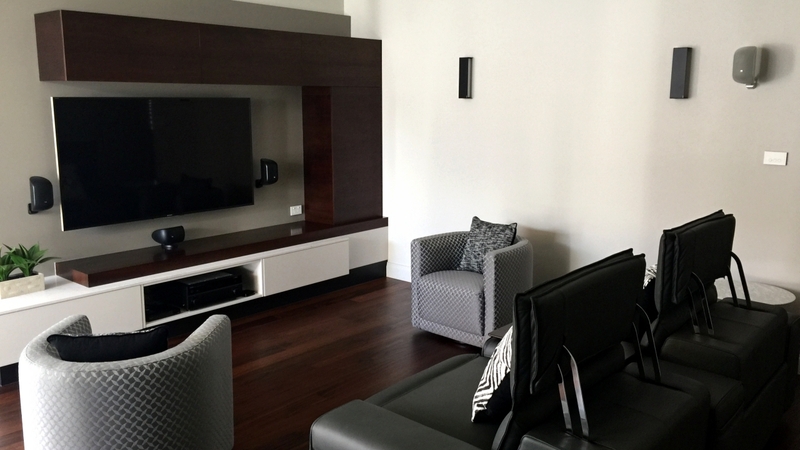 We are experts in home theatre installations in Canberra, with particular experience in tailored and customised installations. Our installation technicians are impeccable professionals, ensuring before each job starts we have the parts on hand so every installation runs smoothly and within the time specified. so you’re getting quality components at reasonable prices. and we can fill in the gaps from our own stock. It’s up to you! We offer a complete home theatre solution. there is no set up we haven’t seen over the years, and no challenge we can’t resolve. offering cable concealment too so that your system doesn’t look cluttered or amateur. Get in contact today to start realising your home theatre dreams!